IATSE (The International Alliance of Theatrical Stage Employees, Moving Picture Technicians, Artists and Allied Crafts of the United States, its Territories and Canada) is a labor union supporting efforts to establish fair wages and operating conditions for its members. It has embraced the development of new entertainment mediums, craft growth, technological innovation and geographic growth. We have been providing support and maintenance services for several years. We’ve provided functionality bugfixes, visual improvements, third-party widget integrations, Drupal security updates and more. We have also assisted IATSE in doing some major overhauls to their header, navigation system and the way they promote content on their homepage. 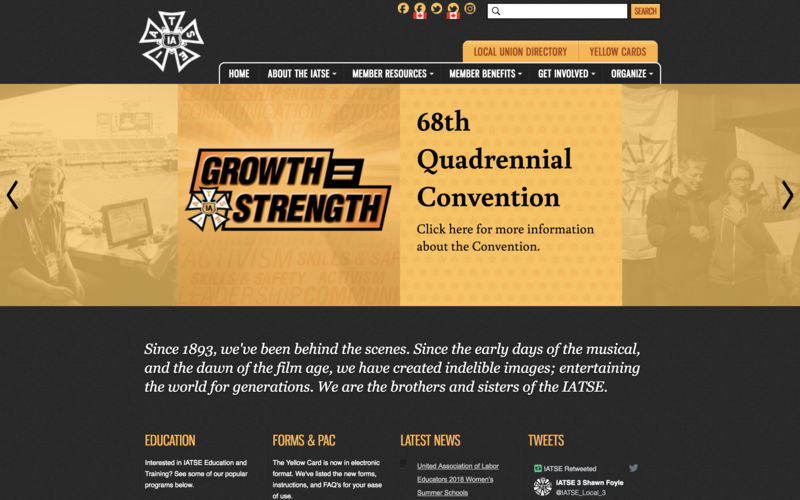 In 2017, IATSE came to us with a few worries about their website navigation. Users had been finding it hard to locate information on the site. This was mostly because the primary navigation only showed top-level links (until you got deeper into the site). There was no visual indication for site visitors for helping to find commonly sought-after pages, and there was lots of space not being utilized. While they had a mobile menu, it was not very user-friendly. Further, their search form was not obvious or following accessibility best practices. To clear up those problems, we completely rebuilt their navigation from the ground up. We added a modern dropdown menu system that was accessible to all site visitors. In addition, we also provided a way for IATSE to include “call to action” buttons that assist immediately point users to critical pages of the site. The mobile menu was replaced with one which was smoother, cleaner, easier to use. It also included attention-grabbing “call to action” buttons. All of those new changes caused us to do some thinking around how to best use the available header space. After tackling the header, we turned our attention to the homepage’s content problems. Users were not engaged or being given an attractive path deeper into the site because admins had no way to add content that would be featured on the homepage. There was a carousel on the page that took up a huge amount of screen real estate, and it was used entirely to promote testimonials from individual members of the union. In short, there were concerns that the homepage could be used better to hook users. IATSE liked the idea of a carousel but thought it could be used better, so we rebuilt it for them in a way that was more responsive and took up less space. Instead of member testimonials, the carousel could now feature any type of content that IATSE wanted. Apart from the carousel, we also provided a new region of the homepage that allowed for presenting any kind of content in a popular teaser or “card” format. As part of our maintenance offerings, we ensure that the site remains up to date with security patches. When the internet community discovers and fixes vulnerabilities, we have a rigorous method for making use of those fixes to the website while making sure that nothing breaks. As part of our support services, we sometimes add new capabilities and fix bugs. This ensures that the website stays useful for IATSE as their needs change. Things break or don’t work as intended sometimes – this is the nature of having a web presence. We’re there and ready to help diagnose alternatives or come up with a solution that works within budget and time constraints.